In our last months living in Malaysia, my family and I squeezed in every second of travel we could possibly squeeze in. It all went by so fast and everything was so busy that sometimes I'd visit some amazing new place or country and not even make a peep about it here on my blog, or on facebook, or even to best friends. Now that I'm home and things are *starting* to feel a little more normal in life (what's normal? I'm kind of glad it escapes me), all our travels can seem like some sort of crazy dream. Like, wait, was I really in Laos just a few months ago? And maybe it's not too late to share some neglected cool stuff from there and elsewhere in my last few months of living abroad. I have a thing for weaving. Maybe because my aunt is a textile designer and as a kid I always looked up to her (she was a real artist! Wow! Could I be like her someday?). Or maybe because of the texture. Or the implicit warmth in the medium. Or maybe it's because textiles are just so beautiful. Anyway, my work-in-progress novel has a grandmother character who is a weaver and who also spins thread so it was lucky serendipity that I got to watch some weavers in action while I was working on writing a book that included their craft. The weaving studio I visited in Laos is owned by an American woman, Carol Cassidy, who hires local weavers and designs pieces for selling abroad and in her gallery. 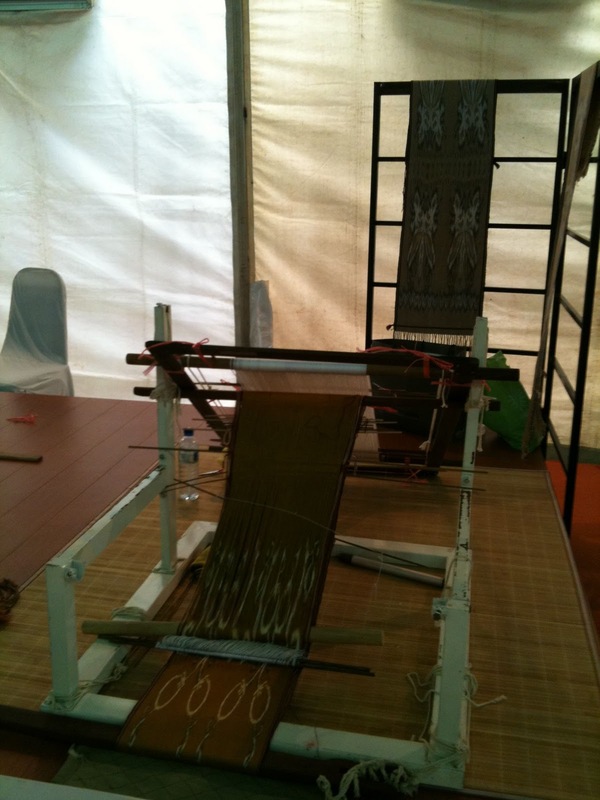 She is working to keep some of the more traditional methods of weaving and ikat alive. Woman weaving an ikat piece. What's ikat? AWESOME is what it is! 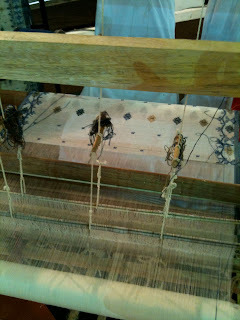 It's a kind of weaving where the threads are tied in tight bunches before they are dyed. The dye doesn't color the parts of the threads that are tied so that after you remove the threads, whatever color was underneath remains the color it was. A beautiful pattern reveals itself when the threads are later woven into cloth. Ms. Cassidy, the owner of the studio, was there when we visited. She showed us around and said it was fine to take pictures and watch. 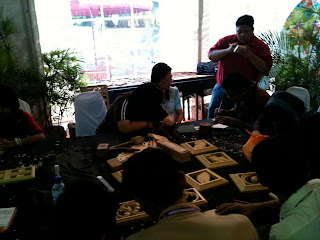 It was one of my favorite craft experiences I had while living in SE Asia. Ms. Cassidy was a delightful host and her enthusiasm and passion for her studio and work brought a smile to my face. Also, as a side note, if you ever get the chance to eat Laotian food, do! It's delicious. Lucky for me, while I wanted to go to Laos to check out some weaving, my husband wanted to go for the food. He took a cooking class. Yum! And our son? Well, there was good stuff for Oscar in Vientiane too. This is a continuation of the last post I put up featuring highlights from the 2011 L.A. SCBWI Conference Illustrator Intensive. If you missed PART 1, please read that first. -He said growing as an artist helps him grow spiritually. Without that, life feels kind of empty. He said art is a window to one's spirit -- the hope is that others will feel what he feels when he makes it. - If you put love into your art, love will come out of it. - A good painting is feeling the spirit when you make it, a great painting is when you transfer that to the viewer. -His talk inspired me on a spiritual level. After watching and listening to him I felt a little window open in my head for how I can be braver in my own work. Amen for that. -She did a demonstration of her pulp painting technique, which I was especially happy to see in person being that I'm a paper maker too (I don't do pulp painting, but I make a lot of the paper in my collages). For those interested, Denise has a detailed youtube video about how she works here (skip ahead to about the 10 minute mark to see her working in her studio). -She uses a series of cut-out foam stencils that she fills with pulp using squeeze bottles. -She buys ready-beaten pulp from twinrocker paper-making suppliers (I use the same company to buy my pigments but I beat my own pulp -- but not in the technically proper fashion as the twinrocker folks do. I use the low-tech approach: a kitchen blender, which has pluses and minuses I'm well aware of). - When she makes paper with kids in schools she uses embroidery hoops as the moulds and deckles and sometimes has them use cookie cutters for the stencils. -Denise is a funny and spirited artist. I will forever be in the Denise Fleming fan club after she generously offered all-night critiques complete with loads of laughs and insight at the Weekend in The Woods Retreat in Washington State several years ago. So it was especially fun to get to see her creating her work in person at the illustrator intensive. -One of my favorite things he said was: "The artist's duty is not to surprise the viewer but to surprise himself." -David demonstrated drawing loosly and fast and encouraged artists to practice drawing fast and from life, often. Try 1 minute, 2 minute and 5 minute timed drawings, just like you may have done in art school -- only keep up the practice. -He learned to keep things lively by copying famous works of people who he admires. -Many of the picture books he has illustrated are written by his wife, Sarah Stewart. He said his philosophy of life can be the opposite of Sarah's and there's something beautiful about melding the two opposite philosophies of life into the same works. -Prefers drawing in a really classical sense. -Another favorite quote: "Drawing is like breathing." -He draws from photos and keeps a large library of favorite nature pictures for reference. -He said that if his personal life feels rocky, he sometimes uses the drawing as a security blanket and a place to go. -He never spends more than 3 days on an image (but it could be 10-hour-days if he's working really intensely). -If he gets stuck he tries changing around his palette, changing around his subject, or sometimes it's a deadline that gets him unstuck. -When he draws he doesn't worry about a light source, he just worries about where he wants your eye to go. Yes! It was a day of WOW! I gained many personal insights that I started to write into this post but decided were better saved for their own post (maybe next week? Can I stretch things out that long?). Thank you to all the illustrators and those who organized the event. It was a truly remarkable day. If you're interested check back next week and I'll post my personal take-aways. Cheers! My notes from the day: I remember stuff better when I take notes. As I mentioned last week when I returned to Malaysia, the Illustrator Intensive at this year's L.A. SCBWI conference was an unforgettable experience. It's always great to get a chance to hear artists talk about their work. But you're able to enter an entire other dimension when you get to see artists actually do their work. The day was bursting with interesting and delightful tidbits on how these legends of children's illustration do what they do. I loved each and every presentation of the day and I loved seeing them all in a row too. No two people work exactly the same and it was fascinating to compare similarities and differences in such a short space of time. I thought I'd share a few memorable moments from each presentation. And because the day was so rich, I think I'll stretch this into 2 blog posts. Stay tuned later in the week for PART 2. -Paul shared many great details about how he works, the brushes he uses (cheap ones), the paints, how he does an under-painting, etc. -My favorite thing he shared was during the Q & A at the end of the day though, when Paul answered a question about technique versus inspiration. He said artists often start detailed and tighter with their style and move toward a looser style as they mature, but he said that when he was younger he remembered looking at many artists' works who had done that and hoped that never happened to him. He never wanted to give up the more detailed fine work. Such an interesting insight behind his style. -To achieve the subtle and beautiful colors in her drawings she sometimes does dozens and dozens of washes with watercolor , building up colors really slowly. -Often if something is wrong with a painting, she won't realize it's wrong until it's 100% finished. She will look at the piece and think, "Do I love it?" and if the answer is no, she then often starts over. -She feels that it's essential to make the foundation of the book --the story, the drawings -- as best as they can be. The technique for painting doesn't matter if the foundation isn't strong. - He uses many different types of media and loves to experiment. For the demonstration, he painted in egg tempura. - He likes to play a lot with his work, he treats new projects like new adventures. He does small abstracts to practice and play. He finds that new mediums free him up. He said he has a throw-your-hat-over-the-fence attitude about new mediums. You just have to go for it, all in. - I was very inspired by his love of play in his work and how he tries new mediums. It reminded me of how I feel when I dive into a new travel adventure and learn a bit more about the world and life by letting go of the familiar. - I also loved how he confessed that sometimes experiments are a total failure. But then he learns what doesn't work. That's how I feel about travel adventures too -- not every adventure turns out wonderfully, but you never get to reach beyond if you don't try. That's the way adventure works. So you get a glimpse of the WOW I experienced during the illustrator intensive. And the highlights aren't even over yet! UPDATE (8/25/11): I added links to the artists' websites so anyone who is interested can easily check out their work or browse their books. Enjoy! Trickshaws and Satay aren't the only draws for taking a trip to Melaka, an historic town about 2 hours away from KL. 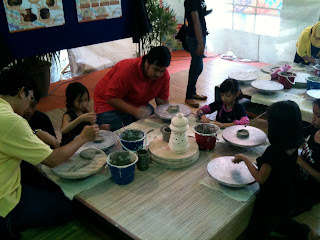 There are also dozens of artist studios, most of which are open to the public, around the Jonker Street Chinatown area. One of my favorites from my last trip to Melaka (a few weeks ago) was the studio of a paper sculptor. He was piecing together teeny tiny paper figurines meant to be burnt as offerings at gravesides. I felt shy to take close-ups of his work, but you can see a bit better if you click one of the above photos. It was hard to imagine burning such intricate miniatures. In the back of his studio I could see larger kite-like paper sculptures too. So that's where some of those trickshaw drivers find the funny-shaped shells to decorate their rigs with. My sister and her husband have been visiting us the last few weeks. They just left yesterday. We had a super fun few weeks together. When Kelli and I get together we tend to make crafty stuff. So it isn't surprising that we had a few crafty adventures while she was here. Like visiting the Royal Selangor Pewter visitor center (touristy? YES!). We took a tour and watched craftspeople work away at making pewter objects. Then we participated in something called "Whack and Snack" at the "School for Hard Knocks." We got to fashion our own pewter bowls by hammering on a flat round sheet of plain pewter. Too bad I didn't have any pent up anger to hammer out or anything -- this would have been the perfect place to do so. Cheesy touristy goodness at it's finest, especially when you get to share the whole experience with your sister! Oh, and kudos to whoever came up with the idea of decorating the walls with pewter hand prints of all people who work for Royal Selangor. I loved those walls. FYI: the snack part of "Whack and Snack" involved tea with croissants. Yummy. 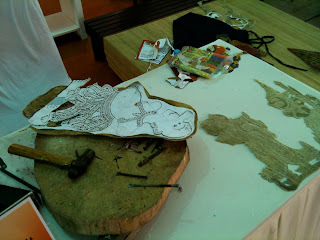 My favorite artist workshop I visited during my recent trip to Kota Barhu was the Shadow Puppet Master's space. Here it is! Right on a river. It was quite the task to find it, and when we arrived, it was locked up. But my taxi driver asked around until a beautiful old woman (I think she was related to the puppet master) with smiling eyes opened the shop and showed me around. There were two stages, one I could see from the outside (a window) and one was inside. The smiling-eyed woman even shut out the light and turned on the oil lamp to show what the stage looks like. This is actually the third shadow puppet master's studio I've visited (I visited one in Bali and one in Thailand). They all use drums to keep the rhythm of the story going. Here's a pile of the puppets (above) and a puppet that's partially made (below). In Malaysia the traditional shadow puppet art is known as Wayang Kulit. Now, if only I'd been able to see a show. (I have seen them before, both in Bali and in Thailand -- the biggest treat is to see the puppet masters in action behind the curtain. It's a beautiful art). During my recent trip to Kota Barhu my family and I also visited a batik factory. and have even tried it myself. 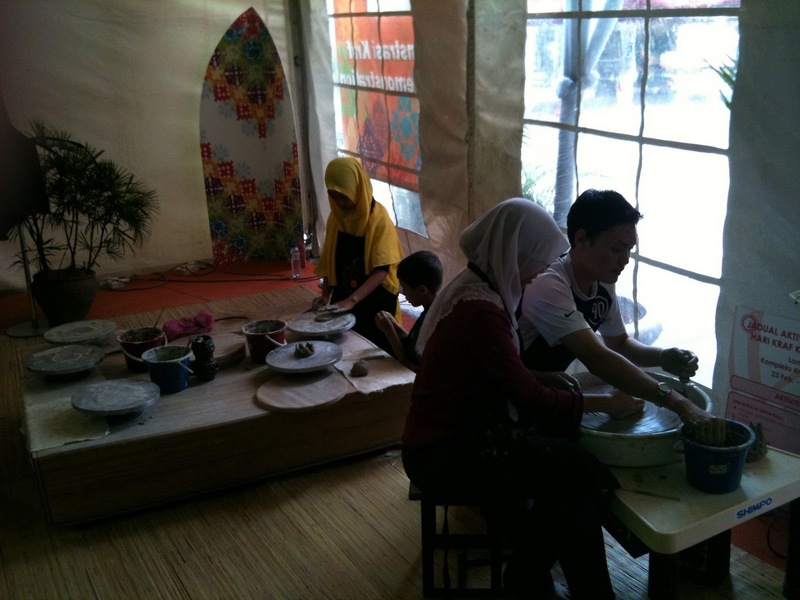 But this was a neat experience because the Batik being made at the factory I visited is the kind that I often see local women wearing. It's not made for the tourist market, in other words. It's fun to watch how fast these women paint. And how fast they draw with the wax tool. I tried that, it's not an easy thing to draw with. I love these open spaces where the women work, even if it was really hot in there. It was fun to watch my son's surprising interest in the whole process, too. I gotta say it, I love traveling with a kid. Kite Maker or Collage Artist? Last week my family took a short trip north to an area of Malaysia called Kelantan. Many artists around one of the main cities of Kelantan, Kota Bharu, are especially known for practicing several traditional Malaysian handicrafts. The painting above and detail of it below, done by a Malaysian artist named Yusoff Abdullah, hung in the airport at Kota Bharu. The painting depicts many of the local handicraft traditions*. One of my favorites of these traditions is known as Wau, or kite making. And the patterns on most traditional kites are intricately cut out of colorful papers and layered over one another. Here's an artist at work cutting a pattern using an exacto blade on a folded sheet of foil. I watched him use a blade sharpener. It made me pause because most paper artists I know back home throw out their blades rather than sharpening them. (I personally most often use a scissors, FYI). Here's a close detail to give you an idea of the layers of paper. Every color below is a different colored paper, glued on top of one another. * The signature here is from the painting at the top of this post. I mentioned that the artist's name was Yusoff Abdullah, a Malaysian artist who I could find little information on, which is why the uncertainty and the lack of links. Please accept my sincere apologies if I've given credit wrong! Also, please correct me, if someone out there knows better, I'd prefer to properly give credit and links if they exist. I live just down the street from Kuala Lumpur's craft complex, called Kompleks Kraf Kuala Lumpur (basically that means Kuala Lumpur Craft Complex in the local Bahasa language). Recently they had a big festival full of artists and craftspeople from all over Malaysia, selling their wares and also offering demonstrations. I only took pictures in the demo area, but my favorite tent to walk through was the tent full of colorful batik clothing. Picture an entire gymnasium crowded with booths of swirling bright colors and floral water-color like patterns. Many of the artists offering demos weren't around when I took these photos, but I was able to go back and watch others later in the day. I especially liked the kite maker, who cut impossibly intricate designs out of foiled paper and layered the designs onto paper stretched over a frame. Hmmm... it just occurred to me that it might be fun to make an illustration sample with one of those kites included. Did I get that idea from the craft complex or by blogging about it? Either way, I'm grateful. It's fun to be inspired to make an illustration sample that's a perfect match for your medium and your current adventure. Did you know paper can be made from elephant dung? 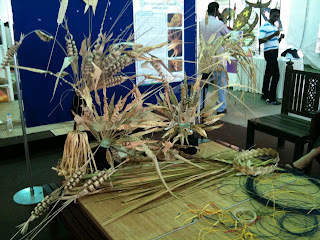 I learned all about it earlier this month at the Pinnawala Elephant Dung Paper Products center in Sri Lanka. Elephants apparently have very inefficient digestive systems. and strain them through moulds just like I do with my handmade paper. The paper-makers let the paper dry on the mould and then, depending on the desired texture, either leave the paper as is (rough) or ring it through a paper press. Then craftswomen and men make the paper into all sorts of handmade goodies: journals, stationary, picture frames, etc. Who knew that *waste* could be so useful, interesting and lead to such crafty goodness? So there's a *fresh* perspective on recycling for you. Back to cleaner subjects next post. I've been in Bali with the family the last couple of weeks. My favorite part was meeting artists and seeing the places where they work. Bali has some of the most amazing handicrafts in the whole world, which is one of the reasons I wanted to go there. and seeing children learning to draw. I also loved this place called Threads of Life which is an organization that promotes preserving traditional weaving traditions throughout Indonesia. Overall the trip inspired me. and perhaps most of all by the way it seemed everyone on the island was an artist (I'm not exaggerating that point). Sometimes I'm frustrated living in Southeast Asia; I feel like there's more obstacles than usual to my work and I'm also so far away from the community I love. But, as I've said before, I'm also so, so, deeply grateful for this experience and adventure into the new and unknown. And I'm not sure why, but it's also making me want to break away from some of my shyness and share my own art with the world better. I hope I can find a way to do so. P.S. two of the above pictures (the crazy painted wall and the creative boat) are actually from a small island called Gili Trawangan, off the coast of Lombok -- the next island to the east from Bali in Indonesia, where we also spent a couple of days relaxing on the beach. There were no cars on the island -- only horse-drawn carriages and bikes. How cool is that? My sister got married this past weekend! Yay Kelli! In honor of her wedding, I thought I'd put up a few pictures from the place that printed her wedding invitations: Bison Bookbinding and Letterpress, located in my current hometown, Bellingham Washington. They were nice enough to let me come watch them printing Kelli's invites late last summer. Bison Bookbinding and Letterpress is a real operating old fashioned letterpress. They combine old printing techniques with new tech ways of making plates. They use a lot of newer environmentally friendly inks and whatnot too. Anyway, I'm a big fan. I had designed Kelli's invites, and it was fun to see how my design translated. I've been riding a total buzz for the last few days because of SCBWI Western Washington's I HEART ART Illustrator Studio Tour that I attended and helped with this past Saturday. Thirty lucky-duckies including myself got to travel around to 4 awesome illustrator's studios and see how they work. The amazing Laura McGee Kvasnosky organized the whole thing and I was an even luckier ducky because I got to help with some of the behind the scenes planning. Laura is one of the most amazing and generous artists I know. It was a treat to work with her. 1. Her amazing house and studio were like a gallery! I loved the mosaics, the way she painted her piano and all of the incredible art she had around her house. 2. She did a paper cutting demo for us. My heart beats faster when amazing artists start cutting paper. 3. She has a book coming out soon about Antoni Gaudi and I am about to go to Barcelona! She had the F&G out in her studio. It looks like an incredible book. I LOVE Gaudi and I think Julie's illustrations are a perfect fit for a book about him. What a treat for me to see them. She also lent me some of her Barcelona guidebooks and had advice about restaurants to go to in Barcelona. WOW! Thanks, Julie. 1. All of her tracing paper sketches, storyboards and drawings. Fantastic! 2. The originals she had scattered all around the studio. This was an inspiring part of the day in each studio: seeing the originals from all the artists was such a treat. 3. I liked the story she told about one of her books. A writer who is also in her critique group had gotten her first book contract. Yay! Then a few months later, Kathleen was asked to illustrate the book. The publisher had no idea that the writer and Kathleen knew each other, let alone that they were in the same critique group. They handled everything very professionally though and it was a fun serendipitous match. 1. Again, I loved seeing Nina's originals. Especially some collages from Roberto, The Insect Archetect, which is a book I oogle over. I also loved seeing the way she boxed up her work for shipping. This was very useful to me and I could see myself using a similar method with my own work. 3. Her studio is so cute and cozy. I especially like her thinking loft. 1. Laura did an awesome demo of the wash technique she uses in her work. I loved watching the black ink wash away to reveal a little illustration. 2. Laura had my art sample on her wall! Which made me feel all warm and cozy inside. 3. I love the border on Laura's backsplash that's made of old typeface. She also has an amazing typeface coffee table in her house. 1. Yay for crafty time with other artists! I had helped Laura gather supplies for making valentines and it was fun to see them put to use. I also loved crafting around my fellow illustrators. And I especially loved seeing all their valentines hanging from a clothesline in Laura's living room. 2. Yummy treats! Annie Gage, our SCBWI WWA amazing food lady, brought amazing food for us to eat. Chocolate. Cookies. Yummy things! Oh and Jaime Temairik brought some of her famous cupcakes. Delicious. 3. Seeing everyone so happy after a great day. I loved seeing and hearing reactions to the studio tour. I felt like my face was stuck in smile-mode for hours after I had left. Thanks everyone for a wonderful, inspirational and fun day. P.S. You can check out more photos from the day on this shutterfly page.